43-15 win against Oyonnax was Connacht’s biggest win on French soil. 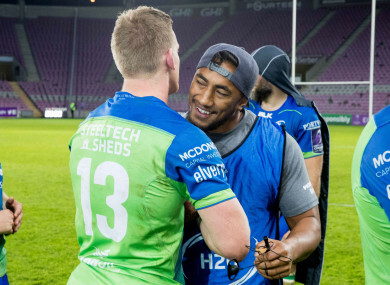 Eoin Griffin and Bundee Aki celebrate: “We fancy our chances with anybody." KIERAN KEANE WANTS his Connacht side to build on their biggest ever win away to a French side when they host Worcester Warriors next Saturday in the European Challenge Cup. Their 43-15 victory over Oyonnaz in Geneva surpassed their 30-12 win away to Dax in 2008 and now Keane reckons they can get some momentum after a slow start to the season. And while Oyonnax were under-strength there was a refreshing spark to the Connacht display, both in defence and attack as they carved out a bonus-point win. Indeed, Oyonnax are the 11th French side that Connacht have beaten away from home and Keane is hopeful that they can back it up next week against Worcester Warriors and push on from there. “That’s been a long time coming, hasn’t it? It was great walking into a noisy, chatty changing room after the game. Obviously, the boys feel relieved about it too,” said Keane. “We fancy our chances with anybody. But we just have to turn up on the day. Today was a beautiful day from the get go in terms of the weather and stuff. It is nice to be able to play in that sort of state. It suits us. “Perhaps we slipped up a little on ‘D’ and leaked a little bit too much. We were going a little high on our tackles, and not hunting at the ruck. It allowed them to get some more momentum. Connacht led 22-15 at the break thanks to tries from Matt Healy, Cian Kelleher and Eoin McKeon. Healy sealed the bonus point with his second try and the rout was completed in the final minute by Darragh Leader. Email “'That’s been a long time coming, hasn’t it? ': Bonus-point win lifts Connacht dressing room”. Feedback on “'That’s been a long time coming, hasn’t it? ': Bonus-point win lifts Connacht dressing room”.